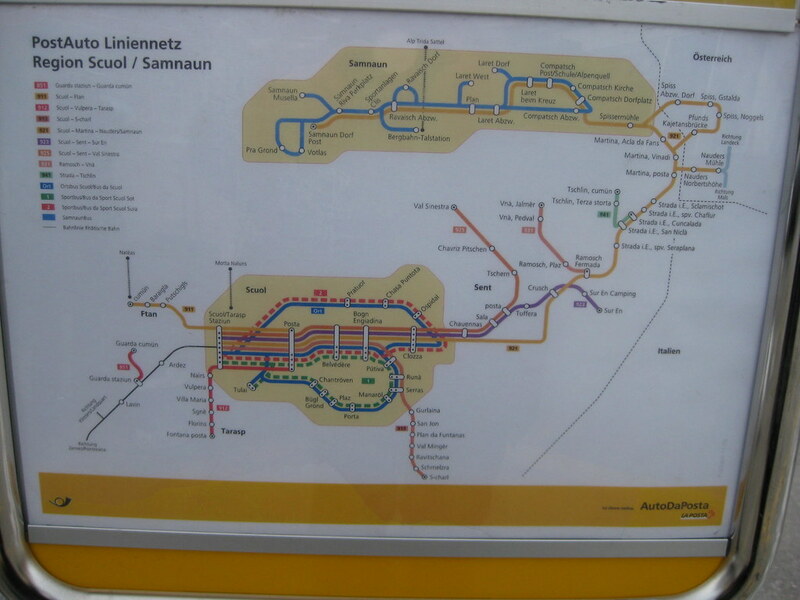 Bus map from Scoul Switzerland from my flickr photos. I just read a review in the NY Times (The World as Their Canvas by Stephen Heller) surveying several books about maps and graphic design. Great survey article, I want all the books! 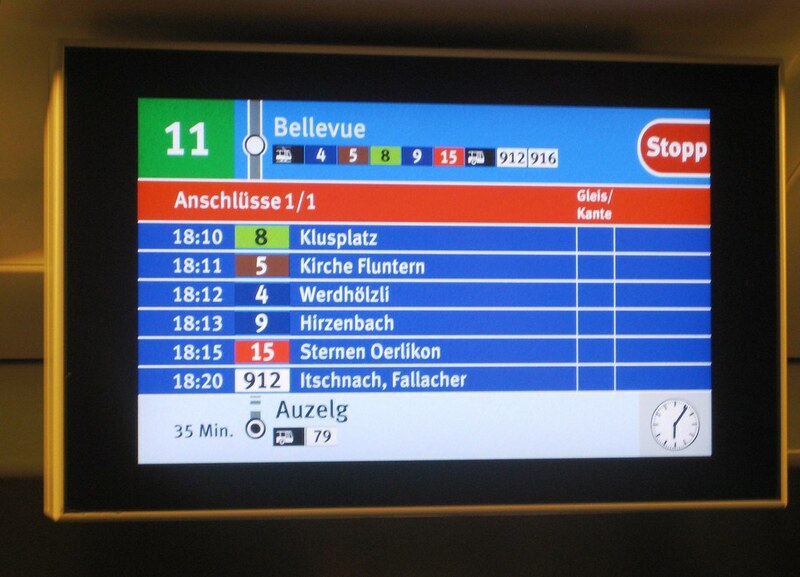 Zurich’s on-board transport information system from my flickr photos. I am helping organize the 3rd Lakeside Conference on Data and Mobility. The conference will explore ways of using data to improve mobility. The last conference focused on weather data but this year the scope will be broader. I am particularly interested in learning about new ways non-professionals can use data to collaborate on transport planning similar to the ideas in my 2010 US Transportation Research Board paper: Web 2.0 Applications for Improving Collaboration in Transport Planning. We are looking for papers! Here’s the call for papers – the deadline is somewhat flexible, send me an e-mail if you have a good idea for a paper but don’t have time to do a full abstract by the February 26 deadline. The conference will run from October 6-8 in Klagenfurt Austria. I am trying to organize a small meeting in Vienna on October 5 for people who come early to learn about some of the interesting things going on here. Contact me for more information. Figure illustrating coordinated set of Web 2.0 tools for collaborative transport planning from my 2010 US Transportation Research Board paper: Web 2.0 Applications for Improving Public Participation in Transport Planning. I just saw the website Transportation for Communities – Advancing Projects through Partnerships (TCAPP). The website “has been created to enhance collaboration in transportation decision making”. My major research interest right now is improving collaboration in transportation planning so I was quite interested in seeing what the website had to offer. In summary, it is a very good description of the transportation planning process (although specifically designed for highway projects many of the concepts are quite similar for public transport). The main purpose seems to be to help citizens better understand the transport planning process and it does a good job. It also includes a tool to help either stakeholders or practitioners “identify what is going wrong in a process”. That’s quite an interesting and helpful feature I think. Other interesting features are the decision guide and case studies. The website does not provide Web 2.0 tools that actually enable citizens to collaborate in the transportation planning process as I have proposed, but is a very valuable addition to the “library” of information needed to help support an integrated set of applications (see illustration above).